Twenty seven million years ago a volcanic eruption of immense proportions shook the land around Chiricahua National Monument. One thousand times greater than the 1980 eruption of Mount St. Helens, the Turkey Creek Caldera eruption eventually laid down 2,000 feet of highly silicious ash and pumice. This mixture fused into a rock called rhyolitic tuff and eventually eroded into the spires and unusual rock formations of today. The 18-square-mile Monument is a mecca for hikers and birders. At the intersection of the Chihuahuan and Sonoran deserts, and the southern Rocky Mountains and northern Sierra Madre in Mexico, Chiricahua plants and animals represent one of the premier areas for biological diversity in the northern hemisphere. The Chiricahua Apaches took refuge here during hostilities with whites, and after Geronimo surrendered, in 1886, Bonita Canyon was settled by Swedish immigrants Neil and Emma Erickson. Their daughter and her husband turned the homestead into a guest ranch and worked to make the area a national park. In 1924, President Calvin Coolidge designated the area a national monument. The homestead was named Faraway Ranch by the family. The property was sold to the National Park Service in 1979, and it became a historic district within the monument. Camping Fees: $12.00 per night; $6.00 with Golden Age Passport. Hours: 8:00 AM to 5:00 PM year round. Closed Christmas Day. Peak season is from March to May. The Visitor Center has an audiovisual program, exhibits, computer information station and book sales describing the geology and history of the area. Interpretive programs including talks, guided walks and evening campground programs are presented in spring, March-May, and fall, September-October. Check the schedule at the Visitor Center for specific times and places. Ask about tours of the Faraway Ranch house. There are no food services, gasoline, or lodging in the Monument. Supplies can be obtained, along with these services, at nearby stores and towns. The Visitor Center and campground are fully accessible, including rest room facilities. The Faraway Ranch House can accommodate a narrow wheelchair. 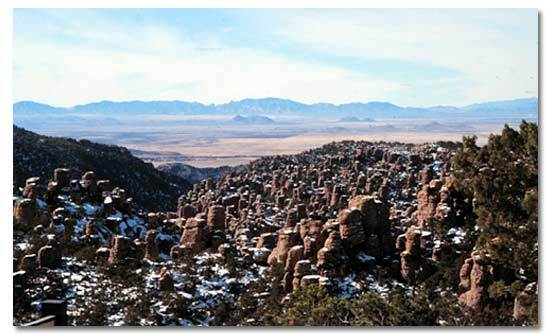 Chiricahua National Monument comprises 12,000 acres in the Chiricahua Mountains of southeastern Arizona. These volcanic mountains rise above the surrounding grasslands to elevations ranging between 5,100 and 7,800 feet. Temperatures are generally mild with summer daytime highs in the upper 90s and nighttime lows in the 50s. Winter daytime highs range in the 50s to 60s and nighttime lows are typically in the upper teens or low twenties but can dip into the subzero range. Moisture is evenly distributed, half during the winter as snow, half in the summer as rain. Daily thunderstorms can occur from July through September. Recommended clothing: Sturdy hiking boots, with good ankle support, are highly recommended when hiking the trails. During the summer, light clothing for warm days and cool nights is recommended. Rain gear is useful during the rainy season. During the winter, wear warm clothing to cope with wind chill factors below zero, snow and subfreezing temperatures. 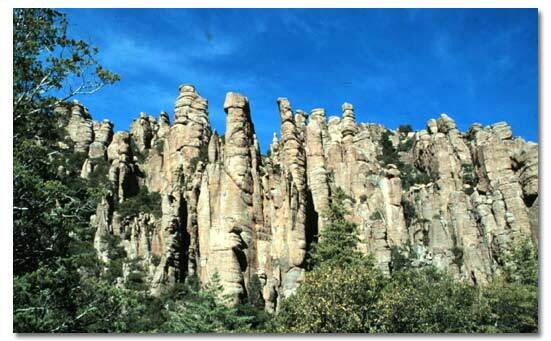 Chiricahua National monument is located 120 miles east of Tucson. Exit Interstate 10 at Willcox, and follow Arizona Route 186, 36 miles south to the Monument. There is no public transportation to the Monument. Commercial airline service is available to Tucson,120 miles west, with rental cars also available. Picnic areas are provided at Bonita Creek, Massai Point, Faraway Ranch, and the Echo Canyon and Sugarloaf parking areas. There is an 8-mile scenic drive to 7,000-foot Massai Point. Chiricahua features 17 miles of maintained trails in a monument that is 90% wilderness. Trails vary in degree of difficultly. The Echo Canyon Trail (3.5 miles) and the Heart of Rocks Trail offer spectacular views of balanced rocks, spires and pinnacles. A picturesque pioneer homestead, the Faraway Ranch, offers daily tours of the house and a chance to learn about the Swedish immigrant family that was one of the first to settle in the area. One can view animals and birds not seen outside the desert southwest. Mammal species include: Javelina, Coatimundi, Fog-nosed and Hooded Skunks, White-tailed Deer, bears, and Mountain Lions. Birds seen include: Magnificent hummingbirds, Black-chinned hummingbirds, Scott's orioles, Hepatic tanagers, Painted redstarts, Yellow-rumped warblers, Red-faced warblers and Black-headed grosbeaks. Fantastic erosion-sculpted monoliths of volcanic rock include Totem Pole -- 137 feet high and 3 feet wide at its narrowest -- the Mushroom and Big Balanced Rock. There is no lodging in the Monument. The nearest hotels and motels are in Wilcox, Arizona, 26 miles north. Bonita Canyon Campground has 25 sites and features rest rooms with flush toilets, running water, picnic tables and trash pickup. There are no hookups or showers. RV length limit is 29 feet. Camping is restricted to the campground. Backcountry camping is prohibited in the Monument. Rock climbing is prohibited in the Monument. Pets are not allowed on wilderness trails or inside park buildings. Mountain bikes are restricted to established paved roads. Benson, Arizona: 75 miles west. Bowie, Arizona: 38 miles north. Tombstone, Arizona: 56 miles southwest. Wilcox, Arizona: 38 miles northwest. Tucson, Arizona: 121 miles northwest. Nogales, Arizona: 180 miles west. Lordsburg, New Mexico: 83 miles northeast. Saguaro National Park: 85 miles west. Coronado National Memorial: 94 miles southwest. Tumacacori National Historical Park: 179 miles west. Fort Bowie National Historic Site: 30 miles north. Tombstone Courthouse State Historic Park: 56 miles west. Kartchner Caverns State Park: 75 miles west. Rustler Park Recreation Area: 10 miles south. Miller Peak Wilderness: 93 miles west. San Pedro National Riparian Conservation Area: 62 miles west. Continental Divide: 50 miles due east.